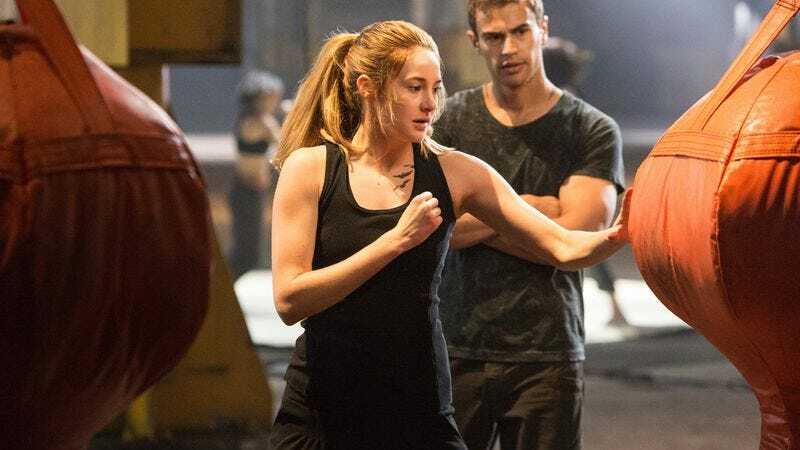 As dictated by the laws of young-adult franchises—laws that we are still awaiting a plucky teenage girl to liberate us from—Allegiant, the final movie of the Divergent franchise, will be split into two movies. It’s a practice that Harry Potter, Twilight, and The Hunger Games have all adopted, ergo Divergent must follow suit if it wants to be considered part of that lineage. (Its $117 million domestic take over three weeks suggests it is, at least in terms of financial success.) That means there will be a Divergent movie every March for the next three years, with Allegiant: Part 1 slated for March 18, 2016 and Part 2 closing it out March 24, 2017, to be followed by whatever teen girl Chosen One will rule over our springs thereafter. Lionsgate hasn’t yet announced where it will split Veronica Roth’s novel, but just from skimming its synopsis on Wikipedia, I am suddenly very tired. There’s a line in particular about “a deadly fight over the bowls used at the faction Choosing Ceremony” which, boy howdy, I just find exhausting. Anyway, probably the first movie will have the bowl fight.